Hyperthyroidism affects a cat's organs, causing a wide range of symptoms. 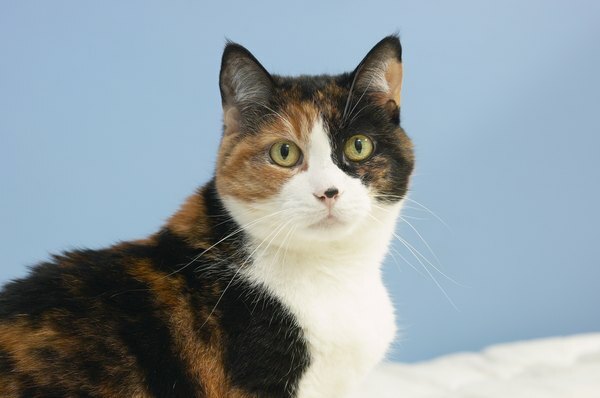 Hyperthyroidism typically affects older cats -- those over the age of 10 years. It occurs when a cat's thyroid glands enlarge and produce too much thyroid hormone, usually caused by a noncancerous tumor. Untreated hyperthyroidism leads to more pronounced symptoms, ultimately negatively affecting the cat's quality of life. The thyroid gland controls the metabolism of every organ in your cat's body. The gland produces a hormone that makes proteins, regulates bodily energy and affects other hormones. When there's too much of it floating around, his organs can't function properly. This condition, hyperthyroidism, can cause additional health issues, such as heart conditions, kidney problems and high blood pressure. Because the thyroid hormone affects every organ in the body, symptoms of too much are seemingly all over the map. No single symptom will definitively point to hyperthyroidism. Most cats with hyperthyroidism lose weight despite having a seemingly ravenous appetite. They drink water just as ravenously, causing increased trips to the litter box. Your cat may look unkempt and develop a dirty, greasy coat; he may practically bounce off the walls with hyperactivity. Hyperthyroidism is a sneaky devil; you may not know your cat has it until his organs start to beg for mercy. The danger of uncontrolled and untreated hyperthyroidism rests in how his organs deal with the overabundance of the thyroid hormone, which is essentially to work overtime in an attempt to process it. His heart beats faster and harder, and his kidneys work harder. Over time, his weight loss can leave him malnourished and weak; also his heart may fail and his kidneys could give out. When you notice your cat devouring his food, running constantly to the litter box and looking like a stick-skinny runway model, it's time to visit your vet. He will run a blood test and conduct a physical check for an enlarged thyroid gland in your cat's neck. If the vet diagnoses hyperthyroidism, you have the options. You may have your cat's thyroid gland removed, you may use medication to correct the hormone production, or you may choose radioactive iodine therapy. Surgery and radioactive iodine therapy tend to cure the problem, requiring no long-term treatment plans. Medication controls the condition but typically requires long-term administration to be effective, sometimes for the rest of your cat's life. What Are the Causes of Hyperthyroidism in Cats? How Are Cats Checked for Thyroid Problems?